Darling in the Franxx is an OVA (Original Video Animation) Japanese television series from 2018 produced by CloverWorks and animated by Trigger. It’s a dystopian romance, science fiction mecha series set in the distant future of the planet where humanity has abandoned the surface of the Earth. Adults, now immortal and no longer reliant on romantic relationships and procreation, have walled themselves off in marvelous, technically advanced cities called Plantations. Children, who are bioengineered, are kept apart, called “Parasites,” and brought up together where they are meant to learn interrelational skills they need to work together in male/female pairs to operate the giant, robotic battle machines known as Franxx to defend the Plantations from mysterious creatures called klaxosaurs. In the early part of the 21st century, humanity’s progress accelerated through the discovery of advanced mining techniques allowing for the extraction of magma as a cheap energy source. Then, an organization calling itself APE, grew in influence over business and politics, becoming the driving force over all world affairs. After the discovery of human mortality, humans would gather into the Plantations under the government of the powerful APE, as a safeguard against the klaxosaurs they unearthed during their advanced mining process. Darling in the Franxx focuses mostly on the youngsters who must pilot the Franxx to battle the numerous klaxosaurs. In particular, a strange girl codenamed Zero Two who plays by her own rules and seems just a bit perverted. She is said to have klaxosaur DNA, which accounts for the small horns on her head. She meets male hero, Hiro whilst she is skinny dipping in a lake. Hiro is having a crisis of confidence at the time, unable to awaken his ability to mentally pair with his partner Ichigo to pilot a Franxx, but during a sudden klaxosaur attack, Zero Two choses Hiro to partner with, calling him her “darling”. A kiss from her seems to awaken his latent ability to pair and pilot her Franxx, the Streletzia. But there is a dark secret to Zero Two – none of her partners survive pairing with her more than three times. Hiro is unphased, for the first time he feels he has purpose and feels alive. His childhood friend and previous partner, Ichigo is obviously jealous of his newfound connection with the strange Zero Two. Darling in the Franxx Part One covers the first 12 episodes of this mecha series and in this first half of the series, it sets itself apart from much of the traditional mecha fare out there. It gives us some very touching coming of age stories and doesn’t focus on repetitive battle sequences between robots as the only means of moving the story along. There are plenty of glorious action sequences, don’t get me wrong, but they don’t revolve the story around it, it’s much more a coming of age story and a romance set to the backdrop of a dystopian future and mecha battles. Speaking of those battles, the animation for the battle sequences in Darling in the Franxx is fantastic as are the character designs, although they are less innovative than they are very pleasing to look at and the 3DCG blends in very well. There aren’t really any moments in this series when one isn’t dazzled by the gorgeous pastel colors, the shimmering backgrounds, or the excellent attention to detail. Where this first half of the series is definitely a bold opening volley (and the second half has been said to have some issues) it is not without its faults either. There’s practically no exposition on the klaxosaurs these kids are being trainsed to fight at all besides passing references to them being disturbed through humanity’s advanced magma mining. That answers no questions, such as, were they living at the core of the planet? Did they come from Earth or are they alien? Are they sentient or are they just acting on raw instinct? Also, this clandestine APE organization, their end goal with the children, and in particular Zero Two and Hiro, or 016, is foggy to say the least. 12 episodes in, there should be a more firm understanding of what they want with these kids. 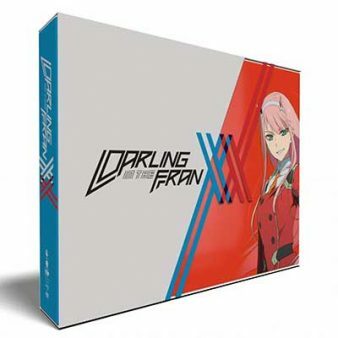 Darling in the Franxx Part One comes to Blu-ray in a varied aspect ratio (2.35:1/1.78:1) AVC 1080p encodement and it looks mostly solid with good color and crisp detail. The minor flaw in the transfer is some mild color banding that does show up in some fills and backgrounds, but besides that, it is satisfying to watch. 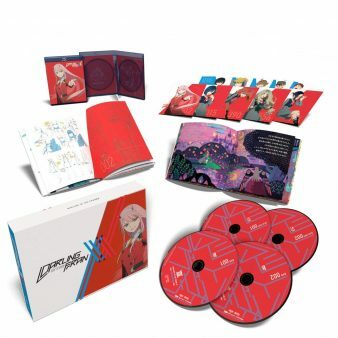 The original Japanese-language mix for Darling in the Franxx is provided in Dolby TrueHD 2.0 stereo and an English dub from Funimation is also included in Dolby TrueHD 5.1. The Japanese 2.0 mix is mastered somewhat low, but it still provided good, clear dialogue and sound effects with a good amount of dynamic range and stereo imaging. The dialogue in the English 5.1dub has a slightly weird tonality, almost like it’s coming through a cup, but that said it’s also clean with no clipping. The surround mix has excellent atmospherics and a decent low end. That said, the acting in the dub is a little flat, almost like they are just reading from cue cards most of the time or forcing enthusiasm the rest. My personal preference here is for the Japanese original, especially since no one in the English dub does anything at all special with any of these characters such as accents or introspection. Despite some flaws, Darling in the Franxx Part One sets itself apart from the average mecha series, offering strong character development and a great coming of age story set in a strange future world of robot battles, sexless adults, and kids caught in the middle of it all. This limited edition set is well worth owning for the content, special features, and the included swag. In a dystopian future where humanity has abandoned the surface of the planet for advanced fortified cities known as Plantations and gained immortality and adults no longer procreate, a group of bio-engineered children are raised separately from the adults in order to learn the skills they need to pilot the giant robotic Franxx used to battle creatures called klaxosaurs. This coming of age, romance, science fiction, mecha series sets itself apart from other mecha series in these first twelve episodes with good character development, a strong coming of age story, and excellent animation.